«Their image of a woman who elects to birth» illustrated quotation. Funny, free quote pictures for Facebook, Twitter, LinkedIn, Reddit, Pinterest and other social networks. 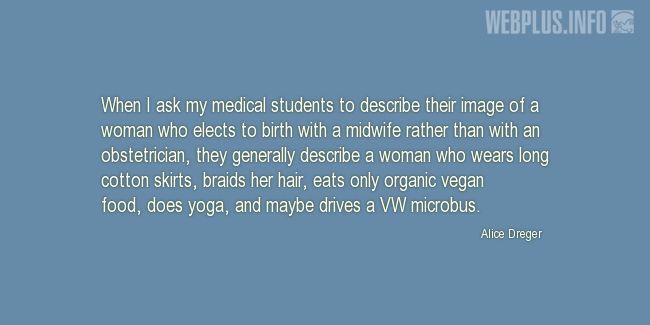 When I ask my medical students to describe their image of a woman who elects to birth with a midwife rather than with an obstetrician, they generally describe a woman who wears long cotton skirts, braids her hair, eats only organic vegan food, does yoga, and maybe drives a VW microbus.